Hi everyone! I’m excited to bring you a review of a recent read of mine. I read Matched quickly. It reminded me of The Giver, which I recently reread and fell in love with again. However, I have mixed thoughts about Matched. 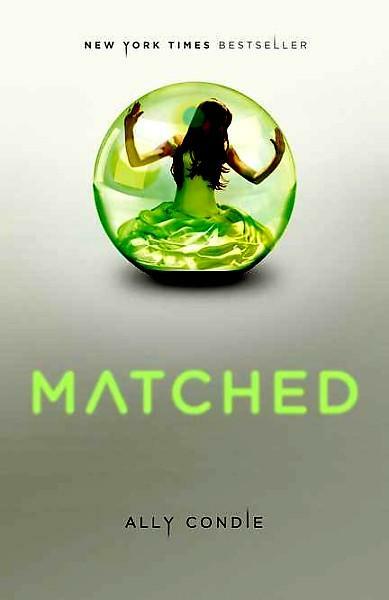 Matched by Ally Condie is a dystopian novel set in a society where every decision is made for you–what you eat, where you work, and even who you love and marry. Every person in this society attends a Match Banquet when they are 17 and are given their perfect match–the person they are most compatible with. Cassia Reyes attends her banquet and is surprised when her best friend, Xander, is her match. This is a most unusual occurrence. But even more unheard of is the fact that when Cassia sees another face–Ky Markham, who Cassia also already knows–on the microcard that should hold information about her match, Xander. Hence, we get a story about the importance of choice, love, and life. The premise of this story intrigued me from the start. The idea that a society run by officials picks whom people will marry (and hopefully fall in love with) is fascinating because of how it changes the role of choice. On the surface, giving people correct choices seems to work. As the novel progresses, we see the holes in this system and the problems it tries to hide. Cassia grapples with the choice between Ky and Xander, between expectation and love, between choice and obedience. One of the most compelling love comparisons is between Cassia’s complicated relationships and her parents’ positive marriage. They are proof, in a way, that the system works. And yet they also push against it, like Cassia. Ky is an outcast. He has been labeled as Aberration, which means he can’t be matched with anyone. Somehow, his information is put in the match system, and Cassia sees his face on her microcard. Honestly, I don’t like him as much as Xander. He isn’t a bad guy. He’s pretty average, really. I do enjoy that he likes poetry and words. I like that he can write and teaches Cassia. I don’t like that he tries so hard just to be average. And I don’t like that he pursues Cassia. Xander is probably one of my favorite characters (besides Cassia’s grandfather–who is intriguing, obedient, intelligent, and unique in a world of forced decisions). He is kind and good. Xander is the kind of guy most girls would probably like to be matched with. And he immediately falls into the role of Cassia’s match. He even helps her prepare to go after Ky at the end of the book. Mostly, I guess I feel sorry for Xander. He tries so hard to be good to Cassia, but she chooses Ky.
My favorite part of the book is the poetry and importance of history and words. I love that “Do Not Go Gentle Into that Good Night” by Dylan Thomas and poems by Lord Alfred Tennyson play central roles in the story. The fact that the society has destroyed words, except for the 100 poems, stories, paintings, etc is fascinating to me. Words have power. To control the minds of the people, the officials control words. I took a class in college about memory and history. This novel reminded me of that class a lot. People create history, which makes it imperfect. Ultimately, this novel was not one of my favorites. It comes down to coincidences. Too many coincidences. Cassia happens to be matched with Xander, who she already knows and which is super rare. Then Ky, who she also already knows, shows up on her microcard. And suddenly Cassia likes Ky. She has known him for years but she decides she likes him after seeing his face on her microcard. Who would Cassia fall in love with if there was no match system? Overall, Matched was a bit too perfectly aligned and predictable for me. But I might read the sequels just to find out what happened. So it was worth the read. Again, I totally agree with your assessment. I went ahead and read the second, which was ok. Haven’t gotten to the third yet. I enjoyed this book! I especially loved the Dylan Thomas poem–I had to go buy a complete book of his poems afterwards haha. The poems were my favorite part! I love that you bought a book of his poems afterwards. That’s awesome! Most of them are a lot harder to understand than Do Not Go Gentle, but the language is absolutely stunning! Honestly the only best thing about this book for me was the pretty cover. I personally disliked this book because I found it too boring and really slow-paced. I thought the premise was promising but the story telling was just flat. The cover is definitely neat. I liked the potential of the story too–but was disappointed as well. Thanks for stopping by! I agree–dystopian novels are very popular right now. And yes the covers of this series are way neat. Thanks so much for stopping by!